Captain Steve Torres and Team My Marlin caught a 500 + lb Black Marlin on 11/25/2015 outside of el banco 1 of the top offshore Puerto Vallarta fishing spots angler Sean Remion with the My Marlin fishing Charter. I get asked alot of the same questions when it comes to our fishing charters so I thought I would make this post about the most frequently asked questions and hopefully I will not have to answer the same questions evey day. First I will tell you a little about our fishing Charter My Marlin Sportfishing inludes everything you need for fishing. We include live baits, fishing licenses, fishing gear, cooler with ice, and experienced big game fishing captain and crew. Our boat the My Marlin brand is Bertram and is equipped for up to 5 anglers. All of charters have a tournament winning crew that have fished in Puerto Vallarta for over 10 yrs but most have fished in Puerto Vallarta there whole life. What is included in the My Marlin Puerto Vallarta fishing charter price? Charters include cooler with ice, live bait, lures, fishing licenses, all the fishing gear needed, and experienced captain and crew. Do you have pick ups in Nuevo Vallarta? Yes we have free pick up in Nuevo Vallarta. Are there any port fee’s? There is a $3 port fee in Marina Vallarta but as of right now it is still free in Nuevo Vallarta July 2015. Do I need to make a deposit to confirm my Puerto Vallarta fishing reservation? Yes it is a 50% deposit to confirm you reservation We accept Credit cards, Paypal. or bank of america transfer. No deposits are non refundable unless it is dangerous and the port captain closes the port. If port closes then we can either reschedule or refund your deposit. When is the best time to catch Marlin in Puerto Vallarta? Typically Blue and Black Marlin Season starts in June and runs until the end of November. \then Decemember through April you can normally still catch small Striped Marlins chack out our Puerto Vallarta fishing reports to see whats biting right now in Puerto Vallarta. Are the Puerto Vallarta fishing Charter prices in Dollars or Pesos? Are prices per person or for the whole boat? All prices are for private Charters for the whole boat not per person you can have 1 or 5 people in your fishing group and it is still the same price. 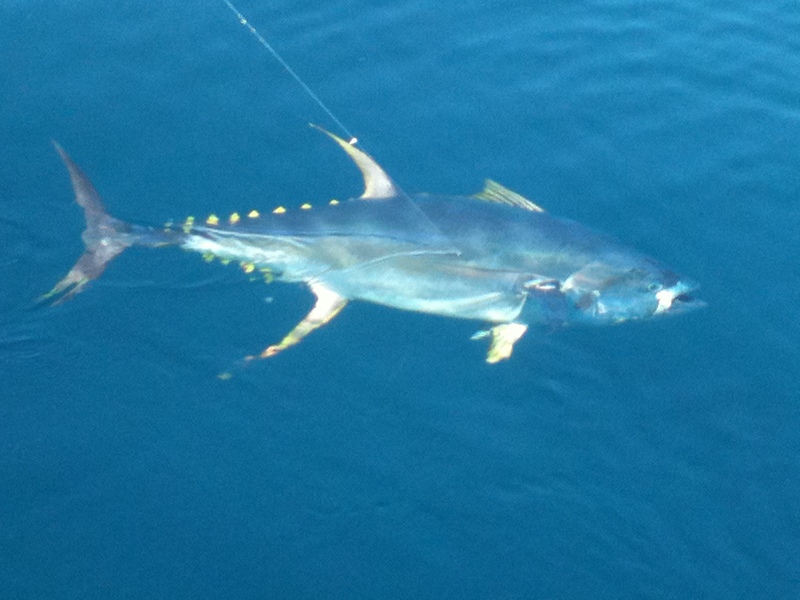 Puerto Vallarta fishing report August 2014. Finally the Yellowfin have shown up at Corbetena through out the year the Yellowfin Tuna bite has been consistent but has been 120 miles offshore this last Monday We finally started to see some life at La Corbetena 36 miles offshore last Monday August 11th there was Schools of Tuna averaging 30-150 lbs. Hopefully We will start seeing some 200 + lb Tuna fish by the end of the week. 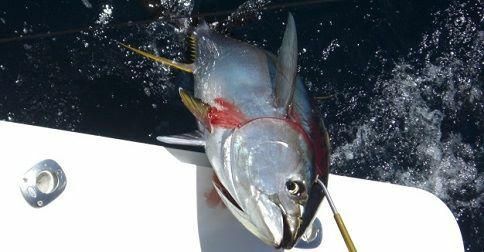 There has also been Smaller Tuna on the south side of Banderas bay averaging 5-12 lbs but the bite been in the evening between 5pm and 8:30 pm. The Small Tuna have been biting on small Sardines. Now back to offshore the waters at the bank were green on Monday and even further offshore by the Islands but Corbetena was nice and blue with a few boils of Tuna, We also caught Sailfish, and Marlin it really felt like Puerto Vallarta fishing is suppose to in middle of August. Though Sailfish and Marlin have been hot at Corbetena all through the summer it just has not felt the same since the Tuna were biting a 120 miles offshore and a overnight fishing charter was needed to reach some Cow Tuna I am very happy to report You can catch some nice sized Tuna on a 10 or 12 hour day right now.